ROG worked with Activision to incorporate customised AURA Sync capabilities and effects within Call of Duty: Black Ops 4 for PC to AURA Sync capable devices. AURA Sync coordinates colours and effects with compatible RGB-lit products like desktops, headsets, keyboards, motherboards, notebooks, and mice. With the AURA Sync integration within Call of Duty: Black Ops 4, actions within the game trigger the RGB light effects to enhance gameplay, reflecting the intensity of the game through the user’s PCs and components, creating a more immersive experience, according to ASUS. “ROG consistently delivers great gaming experiences by working closely with partners and publishers, both on the technology side and on the business side. We’ve collaborated with the eSports teams we sponsor to gain unique insight to provide leading performance and game-ruling innovation. And, similarly, we worked closely with Activision to integrate our RGB-lighting technology, AURA Sync, into this latest version of Call of Duty, to further enhance gameplay." Consumers who purchase an eligible product during the limited promotion period, beginning September 10th, will receive access to the Digital Standard Edition of the game. 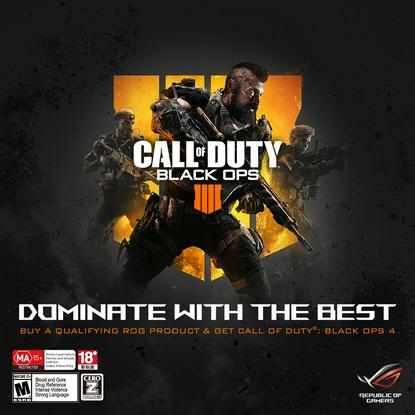 For more information, including the list of products eligible for the Call of Duty: Black Ops 4 bundle, where to buy links, and redemption information, visit https://www.asus.com/au/events/info/1353/.